Italian painter and etcher. 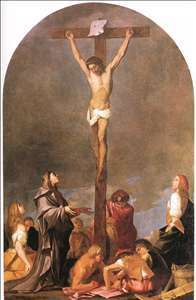 He was a pupil of Alessandro Varotari, through whom he was drawn to the early works of Titian, though he also responded to the Venetian Caravaggesque works of Carlo Saraceni and Jean Leclerc. Around 1631 he and Varotari made a brief visit to Bergamo, where he came into contact with Lombard art. 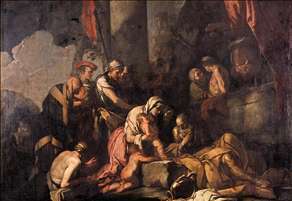 On his return to Venice he became acquainted with Pietro della Vecchia; the etchings of Simone Cantarini and Odoardo Fialetti as well as Nicolas Poussin s bacchic scenes (through the etchings of Pietro Testa) were further influences. In 1638 he settled in Vicenza and executed most of his work there. His first dated works are two vast lunettes, the Apotheosis of Vincenzo Dolfin (1647) and the Apotheosis of Girolamo Bragadin (1648; both Vicenza, Museo Civico), which are close in style to similar works by Francesco Maffei. There followed the Martyrdom of St Catherine (1648; Vicenza, S Caterina), a Self-portrait (Milan, Brera) in which he depicted himself crowned with laurel drawing an antique procession, and the mythological frescoes (c. 1650) in a small room in the Villa Caldogno-Nordera at Caldogno, Vicenza. At this time the Baroque style of Maffei dominated art in Vicenza, and Carpioni only gradually moved away from his influence. His Adoration of the Magi (mid-1650s; Vicenza, Museo Civico), painted for the oratory of the Zitelle in Vicenza, reflects Maffei s mannered elegance and brilliant painterly freedom, while St Nicholas Exorcising the Demons (c. 1656; Vicenza, oratory of S Nicola) suggests a reaction against this decorative exuberance and a return to the naturalism of Caravaggio. After Maffei s departure to Padua in 1657 Carpioni entered the most productive phase of his career. Of his canvases in the oratory of S Chiara, Vicenza, only one is dated, the Five Saints of 1663; they are in an unusual vertical format and include the Baroque St Clare Repulsing the Saracens and the warmly realistic Miracle of the Mule. There followed a series of decorative friezes, which renew a Vicentine tradition, among them the unusually long frieze of putti, allegories and grisaille sibyls (c. 1665; Vicenza, Museo Civico) for the Palazzo Negri, Vicenza, and an allegorical frieze (c. 1665) in the Palazzo Giustiniani Baggio, Vicenza; for the latter he collaborated with the sculptor Giambattista Barberini (d 1666), the quadratura specialists Giuseppe Arighini and Giambattista Gattucci and the fresco painters Pietro Ricchi and Giovanni Ghisolfi. His most important late decorative work dates from 1671 and consists of 11 canvases showing the Triumph of St Nicholas and the Virtues, for the ceiling of the oratory of S Nicola, Vicenza. His most original works, however, are his small bacchanals, indebted to Titian and to Testa, which he interpreted with wit and a melancholy charm. His favourite subjects were the Triumph of Silenus (e.g. Venice, Accademia) and the Realm of Hypnos (e.g. c. 1656, Vienna, Kunsthistorisches Museum. 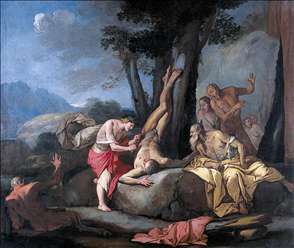 ; c. 1665, New Haven, CT, Yale University Art Gallery). Carpioni was also a gifted etcher, of religious and mythological subjects (e.g. The Elements, and there are collections of his drawings at the Uffizi, Florence, and the Ashmolean Museum, Oxford. See more details about "Liriope Bringing Narcissus before Tiresias"
See more details about "Apollo and Marsyas"